In recent years, the southern regions have been united under the hardline Islamist group Al Shabaab, though the extremists have been losing ground since early last year. Kenya and Ethiopia joined the fight one year ago, and last week a coalition of allied forces finally captured the extremists' last major urban stronghold, the port city of Kismayo. The Players: Who's Fighting in Somalia? Al Shabaab - This movement originated as the hardline youth wing of the Islamic Courts Union (ICU), which ruled southern and central Somalia briefly in 2006. The group is officially a wing of Al Qaeda, though their relationship with the terrorist network has sometimes been strained. Transitional Federal Government (TFG) - The internationally recognized government of Somalia, though it has often been limited to governing parts of the Somali capital, Mogadishu. Units from the TFG's Somali National Army (SNA) have played a supporting role in the advances against Al Shabaab. Kenya Defense Forces (KDF) - The military of neighboring Kenya invaded southern Somalia in October 2011 as retaliation against alleged Al Shabaab attacks on Kenyan soil. The early Kenyan campaign, approved by the TFG, was titled Operation Linda Nchi ("Protect the Country" in Swahili), and was Kenya's first major war as an independent country. Ethiopian National Defense Force - Another neighbor of Somalia, Ethiopia has sent forces into Somalia more than once in the past. Ethiopian involvement is unpopular among the Somali people, who see it negatively as a foreign invader; still, it has low-key approval from the TFG, and has played a key role in beating back Al Shabaab. African Union Mission in Somalia (AMISOM) - An international peacekeeping force originally sent to protect the TFG in Mogadishu, AMISOM has since actively fought to drive Al Shabaab out of the capital and beyond. The force is made up of soldiers from Uganda, Burundi, and Djibouti, and also recently absorbed the invading Kenyan forces under its mandate. Ahlu Sunna Waljama'a (ASWJ) - A moderate Sufi Muslim militia which operates out of Guriel in central Somalia and Dolo in the south, the ASWJ was the first group to make major gains against Al Shabaab, and has fought alongside the Ethiopians after the invasion. ASWJ is backed by Ethiopia and allied with the TFG, though its relations with the latter are sometimes tense. Ras Kamboni - Named after the town at the far southwestern tip of Somalia where Islamists made a last stand against Ethiopia back in 2006, this splinter militia of the original Ras Kamboni Brigades has switched from being anti-Ethiopia to anti-Shabaab. Backed by Kenya, Ras Kamboni forces were the first to push the extremists back from the Kenyan border, and have continued making major contributions to the war effort. Shabelle Valley Administration (SVA) - A would-be regional government for central Somalia, SVA forces fought alongside the Ethiopians, the ASWJ, and the TFG to liberate the city of Beledweyne. However, they have political disputes with the TFG and ASWJ, which also want control of the region. 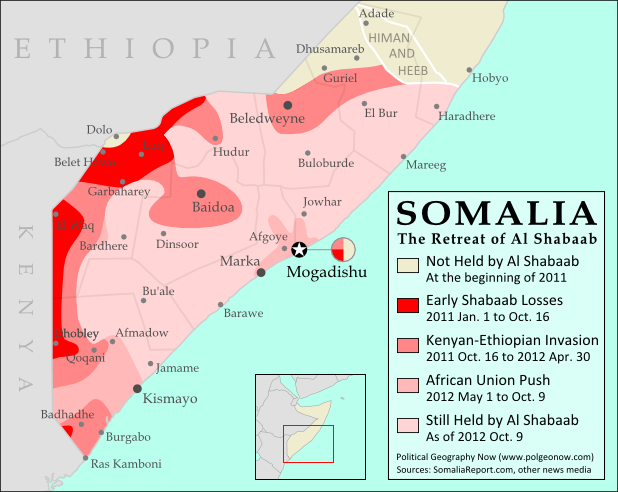 2011 Jan. - Al Shabaab's territory is at its greatest extent, after absorbing rival Islamic militia Hizbul Islam. 2011 Mar.-Apr. 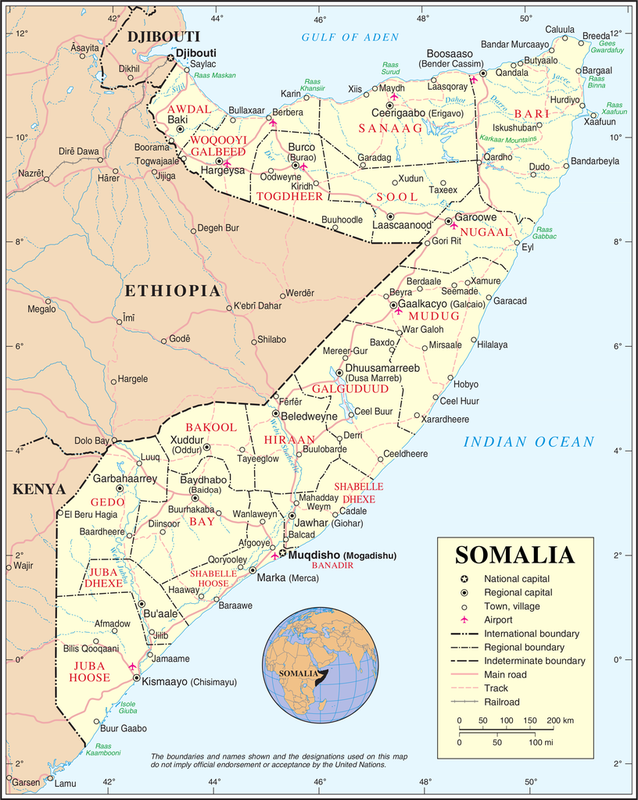 - ASWJ forces with Ethiopian and TFG support carve out a large area of territory near the Somali-Kenyan-Ethiopian border, taking regional capital Garbaharey near the end of April. 2011 Aug. 6 - Al Shabaab stages a major withdrawal from Mogadishu, the Somali capital, after suffering defeats at the hands of AMISOM. The militia's forces will remain in the capital's outskirts for many more months. 2011 Oct. 16-20 - Kenya launches a three-pronged invasion, entering through El Waq, Dhobley, and Ras Kamboni. ASWJ and the Ras Kamboni militia have already cleared the way, and the KDF initially extends their conquests only as far as Qoqani and Burgabo. 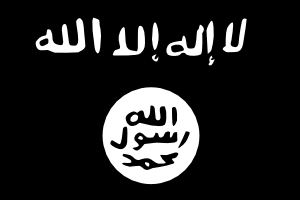 The war flag of Al Shabaab is the banner of Al Qaeda, based on Muhammed's Black Standard. Public domain graphic by Ingoman (source). 2011 Oct.-Dec. - Heavy rains leave Kenyan forces stuck in the mud, and time is spent defending from Al Shabaab's guerilla attacks rather than advancing on the enemy. Meanwhile, Ethiopian troops begin crossing the border in large numbers. 2011 Dec. 31 - Ethiopian, ASWJ, TFG, and SVA forces capture Beledweyne, the largest city held by Al Shabaab in central Somalia. 2012 Feb. 9 - Al Shabaab publicly joins terrorist network Al Qaeda. 2012 Feb. 22 - Ethiopian and TFG troops seize Baidoa, a major city in the interior of southern Somalia which has been held by Al Shabaab since Jan. 2008. 2012 Mar. 16 - TFG and AMISOM forces expel Al Shabaab from their last remaining strongholds within Mogadishu. 2012 Mar. 22 - Hudur, a regional capital north of Baidoa, falls to TFG and Ethiopian forces. 2012 Mar. 26 - ASWJ and Ethiopian forces in central Somalia take El Bur, an important Shabaab base, but lose it again two months later. 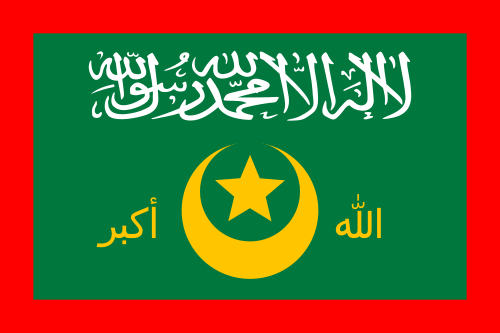 Flag of the ASWJ (source). 2012 May 25 - TFG and AMISOM troops capture Afgoye, a key town just outside Mogadishu. 2012 May 31 - Kenyan troops and Ras Kamboni finally capture Afmadow, a key town on the way to Kismayo, after originally hoping to take it during the first weeks of the invasion. 2012 July 6 - KDF forces in Somalia are formally absorbed into AMISOM, technically ending the Kenyan invasion. 2012 Aug. 20 - The Transitional Federal Government reaches the end of its tenure, and is replaced by a new government in a limited election. 2012 Aug. 28 - Marka, Al Shabaab's second most important port city, is secured by TFG and AMISOM forces moving west out of Mogadishu. 2012 Sep. 28 to Oct. 2 - TFG troops and Kenyan forces under AMISOM enter Kismayo, Al Shabaab's last major urban stronghold and most important port city. The battle includes an amphibious invasion conducted by the Kenyan navy. After a few days of uncertainty, allied forces control the city.